TS LAWCET & PGLCET Results 2018: Download Telangana Lawcet Rank Card and Pglcet Rank Card at Manabadi, lawcet.tsche.ac.in. Candidates can check their Telangana State Law & PG Law Common Entrance Result with marks below. Basically this exam is for Admission into the 3 year and 5 year LL.B / B.L and LL.M Courses which are conducted by the State Universities of Telangana, The Affiliated Colleges of Telangana will responsibility for the Academic year 2018-19. 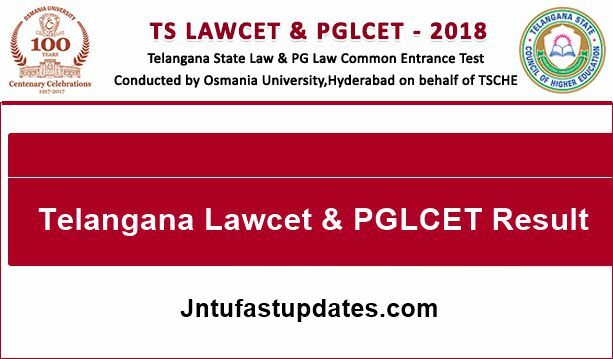 A Common Entrance Test, designated as Telangana State Law Common Entrance Test-2018 (TS LAWCET-2018) and Telangana State PG Law Common Entrance Test – 2018 (TS PGLCET-2018) will be conducted by the CONVENER, TS LAWCET/ TS PGLCET-2018, Osmania University, Hyderabad on behalf of the Telangana State Council of Higher Education for admission into 3Year / 5Year LL.B. Regular Courses and 2 year LL.M. Courses in the Colleges of Law in Telangana for the academic year 2018-19. TS LAWCET / TS PGLCET Results will be declared today at 12 PM. 2) RANK column consists either Rank or ‘NQ’ or ‘WH’. For WithHeld candidates result will be awarded after submission of required evidences. What are we supposed to do after the rank card has come to us. What is the next procedure?